Farrar, Straus and Giroux, 9780374258597, 128pp. Thom Gunn was an Elizabethan poet in modern guise, though there's nothing archaic, quaint, or sepia-toned about his poetry. His method was dispassionate and rigorous, uniquely well suited for making a poetic record of the tumultuous time in which he lived. 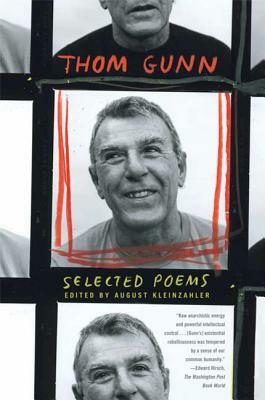 Gunn's dozens of brilliantly realized poems about nature, friendship, literature, sexual love, and death are set against the ever-changing backdrop of San Francisco—the druggy, politically charged sixties and the plague years of AIDS in the eighties. Perhaps no contemporary poet was better equipped—by temperament, circumstance, or poetic gift—to engage the subjects of eros and thanatos than Thom Gunn. This new Selected Poems, edited and with an introduction by the poet August Kleinzahler, supplants the 1979 Selected, presenting more of the later work and providing a fuller retrospective account of the breadth and magnitude of Gunn's extraordinary achievement. Thom Gunn (1929-2004) was born in England but lived in San Francisco for most of his life. He was the author of two volumes of essays in addition to his volumes of poetry. Thom's poetry books include Boss Cupid and The Man with Night Sweats. August Kleinzahler published his first book of poetry, A Calendar of Airs, in 1978. In 2003, Farrar, Straus and Giroux published The Strange Hours Travelers Keep, which won the 2004 Griffin International Poetry Prize. His collection of poetry, Sleeping It Off in Rapid City, won the 2008 National Book Critics Circle Award. He is also the author of the prose books Cutty, One Rock: Low Characters and Strange Places, Gently Explained (FSG, 2004) and Music: I-LXXIV (Pressed Wafer, 2009), and the winner of the 2008 Lannan Literary Award for Poetry and the 2017 American Academy of Arts and Letters Literature Award. A native of Fort Lee, New Jersey, Kleinzahler currently lives in San Francisco.